“With seven sumptuous, individually designed bedrooms, elegant reception rooms, a spa and therapy area, and access to some of Scotland's most stunning scenery, Loch Ness Lodge has everything you could need for an unforgettable event. Each of the Lodge's seven sumptuous bedrooms has been individually styled and inspired by nature, to reflect the majestic beauty of the surrounding Highlands. It seems only natural then that each room is named after a well-loved Highland loch or glen! All the luxuries of a five star lodge can be expected from large, inviting beds dressed in the finest goose-down duvets and Egyptian cotton to the modern amenities of flat screen TV and DVD, CD player, direct dial telephones and of course WiFi throughout. Each stylish en-suite bathroom is complemented with fluffy, white towels and designer toiletries. Fresh flowers and a surprise decanter complete the experience. Active guests can try their hand at deer stalking, archery, quad biking, shooting, 4x4 off-road driving and husky sledding. A spectacular part of rural Scotland with dramatic views over across the water to a string of craggy mountains beyond. Head off on a boat trip around Loch Ness and stop off at the historic Urquhart Castle. Make a trip to the splendid waterfalls at Foyers. Pamper yourself at the in house spa, followed by a spoiling feast at High Tea. Three world-class courses in the vicinity, plus the hotel will organise transport. Anglers can book a fishing trip through the lodge, to catch trout and salmon further along the shores. Endless opportunities from hill walks to full day hikes. Visit the ruins of Urquhart Castle dating back to the 13th century. Book a two hour kayak trip to explore the lake from the hotel's private stretch of Loch Ness shoreline. 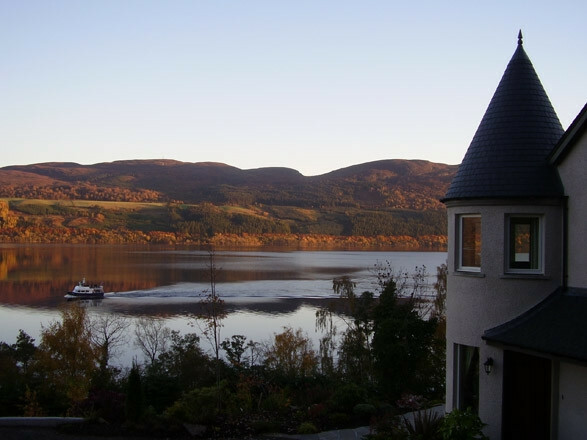 "This faultless bed and breakfast on the shores of Loch Ness earns every one of its five stars."